Due to worsening weather conditions, all Wednesday Evening activities at Lennox Ebenezer have been cancelled. The Christmas Tree is up at the Sayler house and we are preparing our home and hearts for the celebration of Christ's birth. 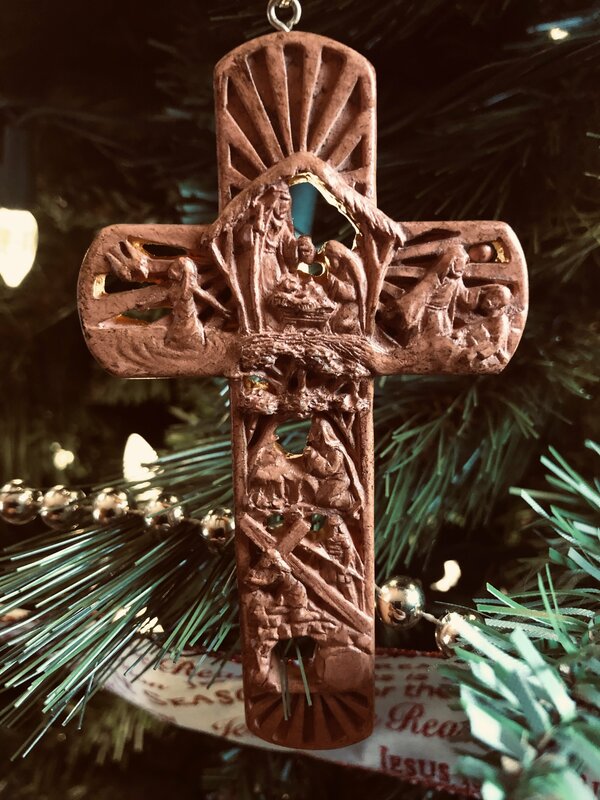 We've always been very careful about how we decorate, avoiding the commercial and worldly images and themes of Christmas, and instead focusing on themes from Scripture - and this is especially noticeable on our tree. Not quite a Chrismon Tree, all of our ornaments fall into 4 categories, Angels, Stars, Nativity Scenes, and Crosses. Now the first three of those are readily seen in the story of Christ's birth, but unless we keep the Cross in the story, the birth loses its meaning and purpose. Indeed, there can be no Christmas without the Cross. What is it that our Lord emphasizes in these verses? First, that He came into the world for a purpose. That is important, for it is uniquely true of Him. It cannot be said of any other person that he or she came into the world to do something. It is often true that there are purposes parents have for their children. They hope that the child lying in a crib will grow up to do something significant in this world. If the parents are Christians, they want their child to be kept from sin and be able to serve Jesus Christ. Parents have those and other aspirations. But the child does not have them. The child has to acquire them. That is why, from a Christian perspective, the child must be taught its destiny from the pages of the Word of God. But Jesus was different. Our Lord says that He came (and was conscious of coming) for a specific purpose. Moreover, He spells that purpose out: "I have come to do your will, O God." What was that will? God willed Christ to be our Savior. I do not know why it is, be we often lose a sense of that purpose in telling the Christmas story. We focus so much on the birth of the baby and on the sentiment that goes with that story - and there is a certain amount of legitimate sentimentality that goes with it - that we miss the most important things. Actually, the story is treated quite simply in Scripture, and the emphasis is always on the fact that Jesus came to die. The Lord Jesus Christ, the eternal Son of God, took a human body in oder that He might die for our salvation. When our Lord speaks of His coming it is therefore highly understandable that He is thinking along those lines. In the tenth chapter of Hebrews the author contrasts the sacrifices that took place in Israel before the coming of Christ - the sin offerings and burnt offerings, by which believers testified of their faith that God would accept them on the basis of the death of an innocent substitute - with Christ's great and perfect sacrifice. It is in the context of that contrast, between the former things and that which has now come, between the shadow and the reality, that he brings in the quotations from Psalm 40. The Lord Jesus Christ came into the world with a purpose, and that purpose was to do God's will: to be our Savior. We miss the most important thing about Christmas if we fail to see that. Boice, James Montgomery. The Christ of Christmas (Moody Press; Chicago, Ill. 1983)pg 14. Here is a schedule of preaching and special events in December at Lennox Ebenezer.